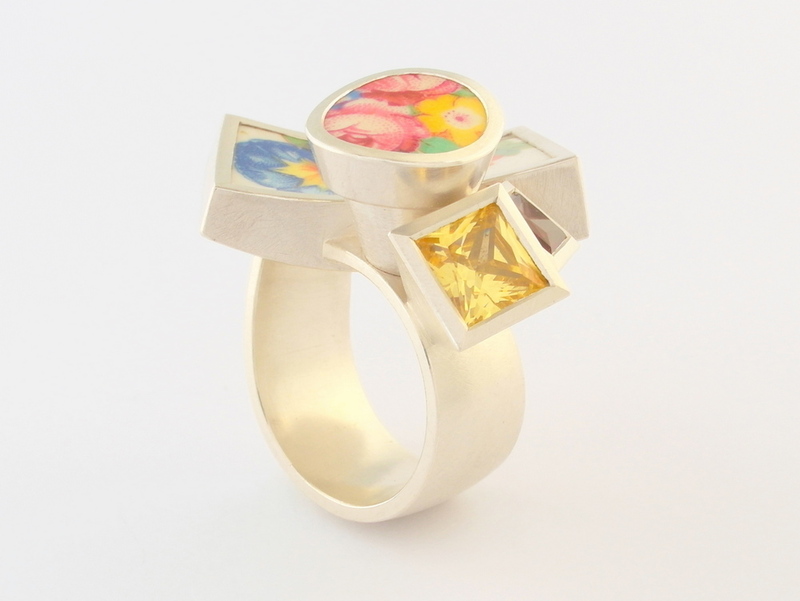 We are thrilled to present once more, stunning hand-made jewellery by local artist Jill Hermans. Opening on Saturday 9th June at 4pm and running till 30th June, the exhibition, Assemblage, will show Jill's continued exploration of her favoured material, the Japanese alloy shibuichi. Light-weight but strong, shibuichi is an excellent metal for jewellery as it will also take on unique oxide colouring, a characteristic Jill exploits to wonderful effect. Everyone is welcome to attend the opening and celebrate Jill's new works. with such a long cold winter this year we are delighted to welcome the change in weather together with 3 jewellers new to oneofftwo! Dore is especially pleased we are also showing (and selling!) a collection of Carole Rigler's gorgeous frocksin our next exhibition, Spring Bloom, celebrating this very welcome change in the seasons. We hope to see you soon, if not at the opening then sometime later as the exhibition is on until Christmas. We are very pleased with how wonderful this exhibition is, thanks to all the contributing artists and we hope to see lots of people at the opening. You're all invited to our fabulous new exhibition that is part of (f)routeville weekend, 1st & 2nd of March. We are so excited (and busy in the garden - der!) to have Costa Georgiadis as our special guest, I hope he loves all of the wonderful (f)ruity jewellery that our contributing artists have made. We are also thrilled to be launching our very own little black book - 'sweet abundance' by Daniel Jenkins. Here we are again extending an invitation to everyone for our forthcoming Easter exhibition, Ocean Blue Growing Green by Pennie Jagiello and Dore Stockhausen. Pennie's jewellery is meticulously made using materials entirely sourced by her many years of beach combing. Discover for yourself her curious and colourful jelly-fish baby bangles and sponge-cup rings. Whilst Dore has been indulging her passion for the colour green and expressing it in her latest enamel and silver pendants and rings. Hey everyone, Dore and I have work in this exhibition opening this Friday. If, like us you have never been to the birthing grounds of the stupendously hyperbolic Dame Edna, well then here's your chance. See you there! Rings @ BILK Gallery, Canberra. For all you jet setters out there I have some work in the forthcoming exhibition at BILK in Canberra. Opening is on Friday - be there! We'd like to extend an invitation to everyone for Marcus' exhibition "Organic geometry", a new collection of contemporary rings at oneofftwo. The opening is on Easter Sunday afternoon from 2.30. Come along and enjoy a drink or two. We're really pleased that Linus and Liam, two terrific jazz musicians will be there to bang out some great tunes. The show will continue through April, closing on the 29th - if you can't make the opening we'd still love to see you.